Jenkins County Middle FBLA recently sponsored a Pink Out Day in support of Breast Cancer Awareness Month. Everyone in middle school was able to get out of their school uniforms and have a little more creative freedom by wearing pink for the entire day. FBLA members prepared treat bags containing candy, pink wristbands, and stickers to its members, the school administration, and support staff. The school entrance was decorated with pink balloons. FBLA was also able to provide facts about breast cancer awareness during school announcements. This event was an opportunity for the school to become aware of the disease and support its survivors. 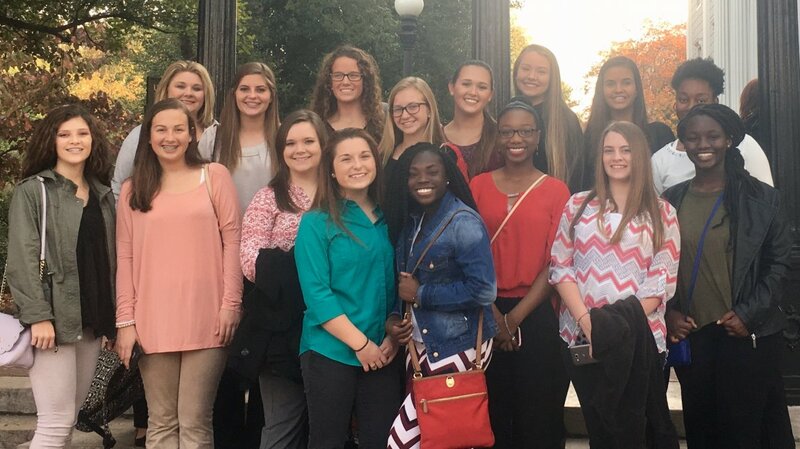 Members of the Emanuel County Institute FBLA Chapter travel to Athens, Georgia to attend the Fall Leadership Conference. Recently, seventeen Emanuel County Institute FBLA members traveled to the Fall Leadership Conference held in Athens, Georgia on November 16-17 at the Classic Center. On this trip, members were able to participate in many fun activities, such as team building and problem-solving at Escape the Space and touring the University of Georgia’s Sanford Stadium. Aside from the fun and touring of Athens, FBLA members were given the opportunity to attend different leadership workshops, meet new people, prepare for competitions, and even play Monopoly against other FBLA chapters! While at the Classic Center, all members and advisers attending were able to compete for the Statesman Award and Battle of the Chapters. Two students, Jazmiyun Wilson and MacKayla Oglesby, and adviser, Mrs. Jessica Smith, earned the Statesman Award. The Battle of the Chapters team consisted of Abigail Cowart, Jenna Hinson, and MacKayla Oglesby. During the general session, those in attendance were able to listen to an awesome guest speaker, Mr. Bill Cordes. Mr. Cordes educated FBLA members and advisers on leadership, responsibility, and led the audience to believe that you only get out what you put in, or YOGOWIPI. ECI FBLA also received recognition for placing third in the Banner Competition. All members had a great time at the conference and are excited about the upcoming competition season!